With the runaway success of his stage productions over the past three years, Bud Martin has firmly planted the flag of the Delaware Theatre Company. With the runaway success of his stage productions over the past three years, Bud Martin has firmly planted the flag of the Delaware Theatre Company. Net result: the number of local ticket sales and theater subscribers have soared. Broadway theatrical owners, agents, actors and investors have all come calling to the Wilmington Riverfront venue. A veteran theatrical producer and director who has worked on both Broadway and London’s West End, since Martin’s arrival for the 2012- 2013 season DTC has seen a 40 percent surge in the number of subscribers, while subscription revenue has climbed by 65 percent. Single ticket sales have risen 221 percent. Revenues have swelled 234 percent and donations have increased by 109 percent. The top three grossing shows of Delaware Theatre Company’s 37 year history have all been staged on Martin’s watch– “Because of Winn-Dixie” (2015), “Maurice Hines is Tappin’ Thru Life,” (2015) and “Ain’t Misbehavin,'” (2014). Martin’s success is the envy of many regional theaters. These days he is fielding calls from premiere talent agencies such as William Morris and Creative Artists Agency. Tom and Mary Page Evans have been supporters of DTC since it started producing plays at the French Street Firehouse in 1978. By the end of this season, DTC will have been a part of developing three Broadway or Off-Broadway bound musicals: “Winn-Dixie,” “Maurice Hines,” and the highly anticipated “Diner” that opens in December. Martin has led a charmed life. Or so it would seem. All it took was four decades of hard work. Smart, driven and well-connected, the Drexel Hill, Pa. native is living his dream. Martin’s life journey has taken him from occupations as a high school and college theater teacher to part-time house painter to investment banker in Manhattan to venture capitalist in Philadelphia with a side career producing and directing professional shows in Philadelphia and New York. After he retired from the financial world in 2008, Martin returned to his passion. He began by directing a theatre show at Act II in Ambler, Pa. and then took over the playhouse’s business operation. In May 2012 Martin took the helm of the Delaware Theatre Company as its artistic and executive director. A fit man with an easy smile, Martin had no illusions about the briar patch he was about to jump into at DTC. In the transformation, Martin cut several hundred thousand dollars from the theatre’s budget and scaled back the full-time staff from 23 to 14. Then he zeroed in on its most important challenges– DTC’s programming. 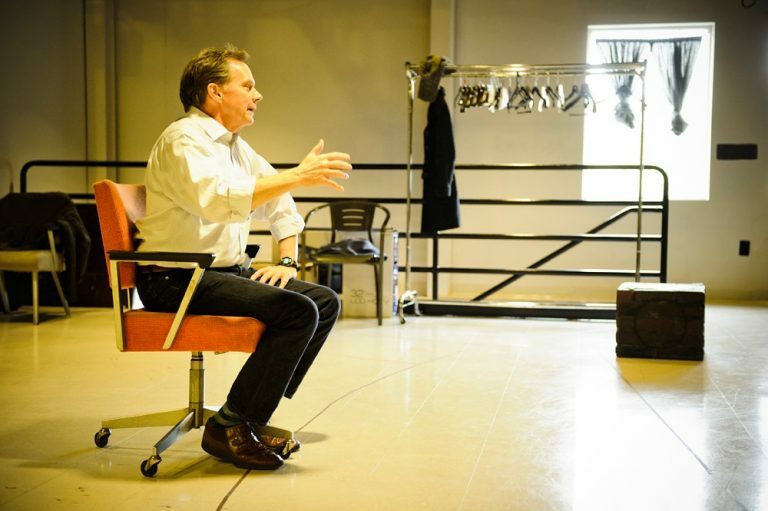 By crunching numbers, serving up an energetic approach and bringing in wildly popular productions as well as thought provoking shows, Martin seriously raised the Delaware Theatre Company’s profile in his first season. Martin directed “Outgoing Tide,” a funny yet searing exploration of dementia and its effect on a family. It spotlighted beloved “Waltons” matriarch Michael Learned and Emmy-Award winners Peter Strauss and Ian Lithgow. Martin closed out that first season directing a spirited revival of the Rodgers and Hammerstein’s musical hit “South Pacific.” The audience was roaring through its three week run. North Wilmington’s David Robson is the playwright of “Playing the Assassin,” a powerful, moving drama about the violence of football, hero worship and atonement currently playing at DTC. Martin caught the theater bug in high school when he played the lead in “Half a Sixpence.” He began stage-managing plays at what is now DeSales University in Bethlehem where his first production was “Bye Bye Birdie.” While teaching theater courses he began to produce and direct professional shows in Philadelphia and New York. Still, with a wife and three kids, financially it was a struggle. A friend brought Martin into the investment banking world in Manhattan. Big success followed. Later he worked in Philadelphia raising venture capital for companies such as Urban Outfitters. All the while, he was a regular Broadway visitor. Martin also launched five companies. In 2000 he started ITRAX, which became a provider of wellness programs in major workplaces. As chairman he sold it to Walgreens for $278 million in 2008. He draws parallels between starting a company and producing a show. The 2015-2016 season kicked off with the exhilarating “Maurice Hines is Tappin’ Thru Life.” It broke the four week ticket sales record of last season’s much loved “Because of Winn-Dixie.” Written and performed by Hines, 70, and directed by Jeff Calhoun, the production paid tribute to his brother, Gregory Hines (who died at age 57) and the singers who have inspired his work, from Frank Sinatra to Lena Horne. A high-energy 90-minute revue, Hines paid homage with both his voice and his feet to the history of American tap. A casting director in Manhattan had seen Hines perform the show at 54 Below which bills itself as “Broadway’s Supper Club.” He alerted Martin. The blockbuster show this season should be “Diner.” It is the musical adaptation of the 1982 landmark film by the Academy Award-winning screenwriter and director Barry Levinson (Rain Man, Bugsy, The Natural) and an original score by nine-time Grammy Award winner Sheryl Crow. There will be 19 musical numbers with a reprise of one song. Kathleen Marshall will direct and choreograph the musical production. All three luminaries will be in Wilmington for rehearsals for “Diner” which starts previews Dec. 2 and runs from Dec. 12 to 27. DTC has already banked more than $100,000 in ticket sales. Set in Baltimore during Christmas of 1959, a circle of childhood friends reunite for the upcoming wedding of one of them. From the comfort of an all-night diner, the men now in their early twenties, confront the realities of adulthood: marriage, careers, money and the mystery of women. Martin admits to feeling some pressure with a show that sports 20 actors and an elaborate set design. When the lights go dark at the theatre, Martin drives thirty minutes to his horse farm near West Grove, Pa. where he’s lived for two decades. It’s a gorgeous 33-acre vista. Retired jumpers graze in a luxuriant pasture. Martin and his wife Kate ride regularly and foxhunt with Mr. Stewart’s Cheshire Foxhounds during the fall and winter. Aboard his handsome bay, Martin gallops over miles of meadows and woodlands, hills and streams. Horses, hounds and scarlet-clad hunters– in the sport of foxhunting, everybody is chasing somebody. Sounds just like Bud Martin in the theatrical world.